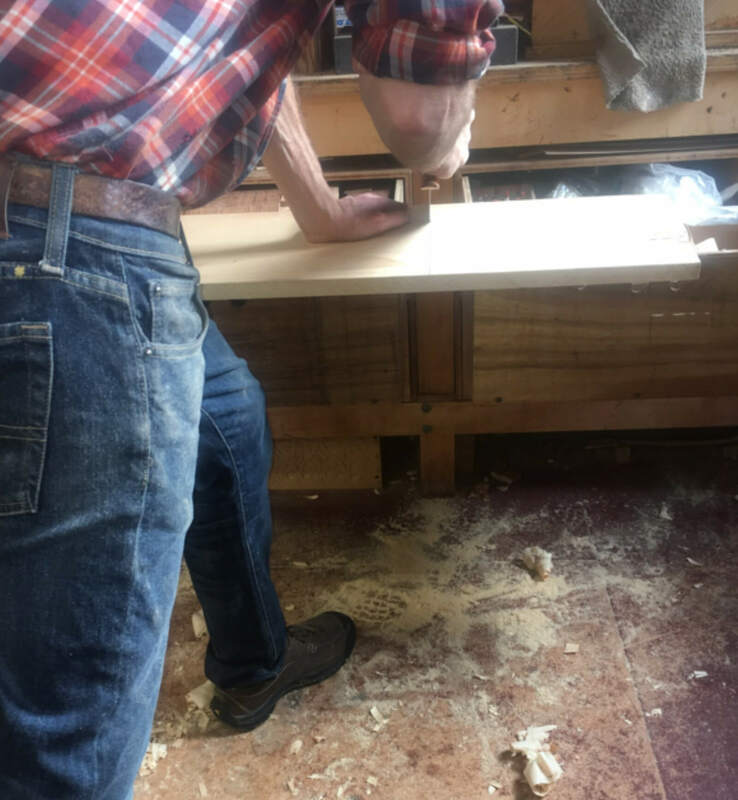 Whether you’re sawing, planing or carving, the transfer of muscle power to the tool you’re using is accomplished by the way you are holding the tool. Hand position sounds like some esoteric study by an anatomist, but it’s extremely important when it comes to tool control and efficiency. 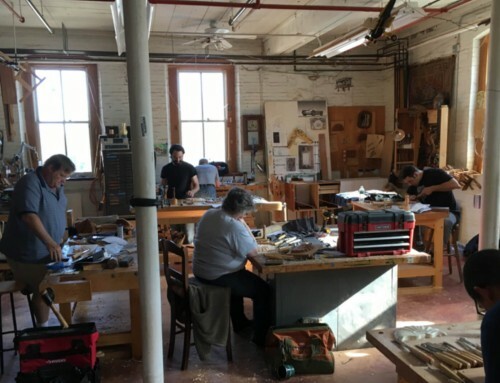 I picked a group of tools that I use almost every day and thought about how I hold them, and then tried to remember the common problems that arise when they are improperly held. 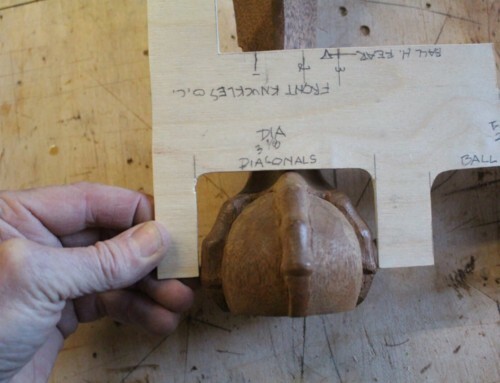 Molding planes never fail to give beginners problems, especially ogees, which try to slide off the work when you run them. A clue about how they were held is found in the wear on the back and sides of the plane and at the very front. The finish is worn smooth where the user’s hands grabbed the plane. The above photo shows wear on the rear corner and a spot on the right side where a finger rested. 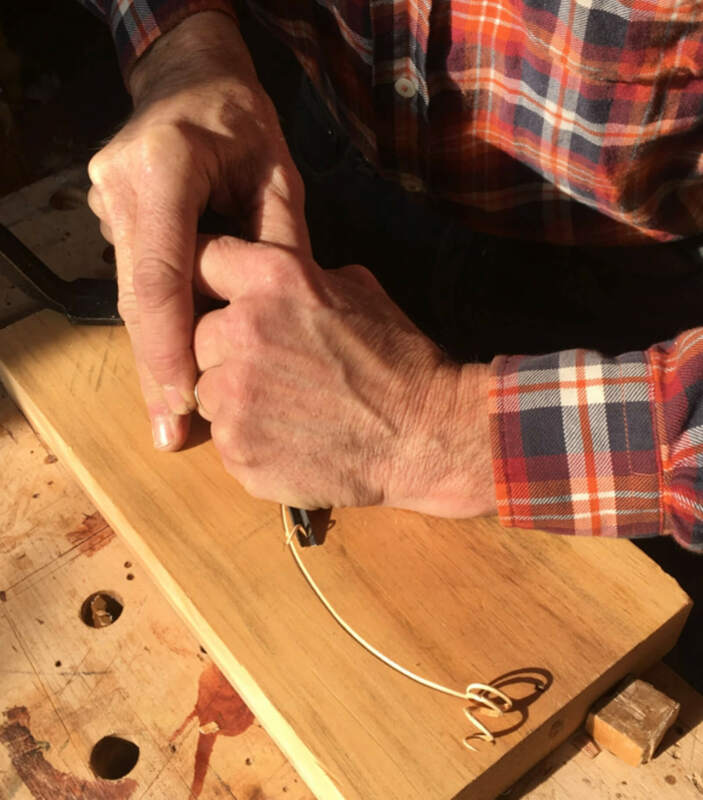 In use, the most important thing to remember is to maintain side pressure with the front hand so the fence of the plane stays tight against the wood, especially at the beginning of the cut. The rear hand does the pushing, and the lower the angle the better, but both hands are pushing the plane to the right to keep that fence up against the wood. Not much downward pressure is needed if the plane is sharp and not set too deep. Two other planes require the same basic technique but are held slightly differently. The Stanley 45 illustrated, or any other plane with fence arms is best held not by the front knob, but by the fence itself so that the user can get closer to the wood with that front hand, sometimes even touching the wood with a finger or two to feed some info back to the brain as to the angle and pressure of the plane as it relates to the wood. 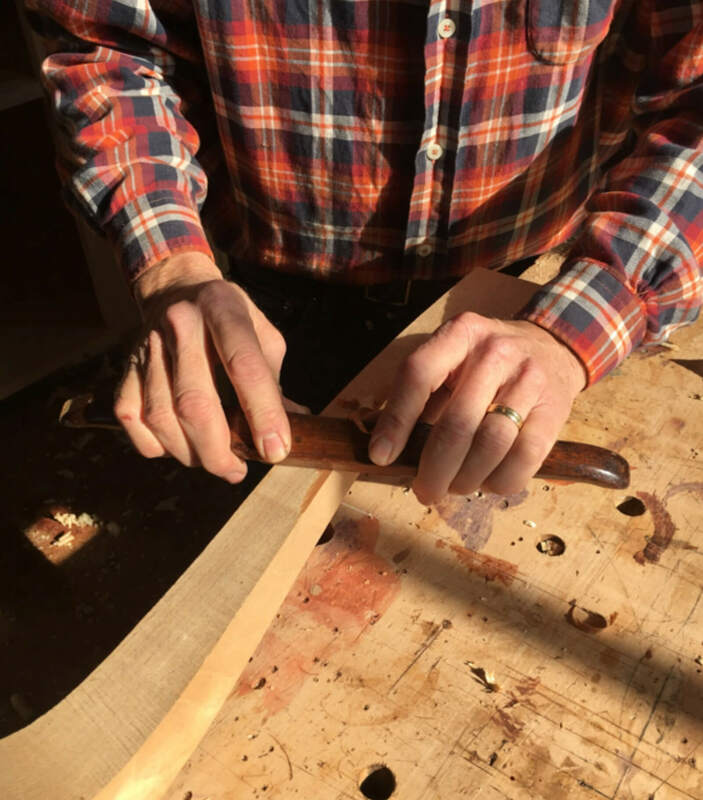 My basic theory is to maintain as much contact between your hands and the wood as possible so that you have enough feedback to know exactly how the tool is cutting. 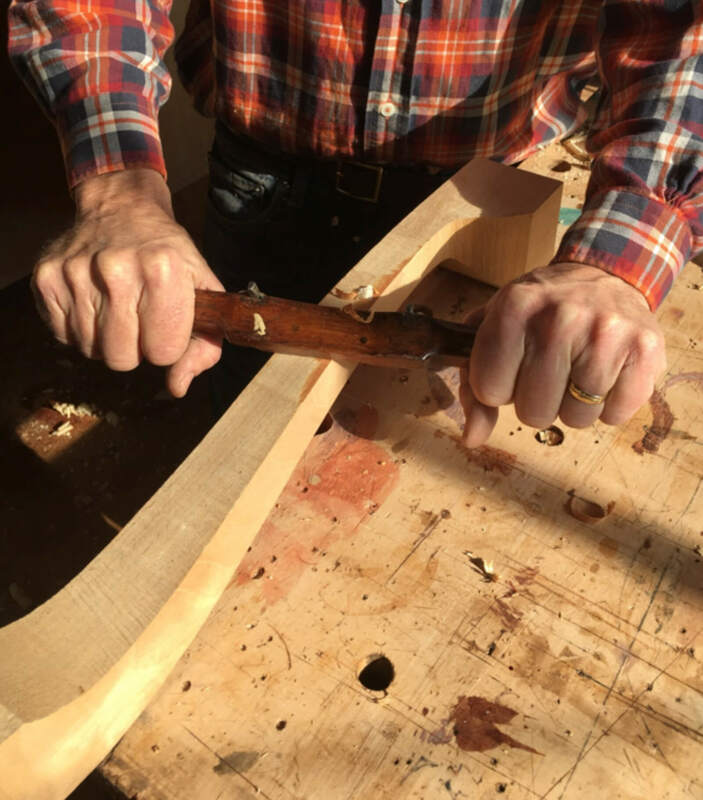 The coffin smoother is held so that the back hand is low, pushing mostly forward, while the front hand holds the plane tight to the wood. 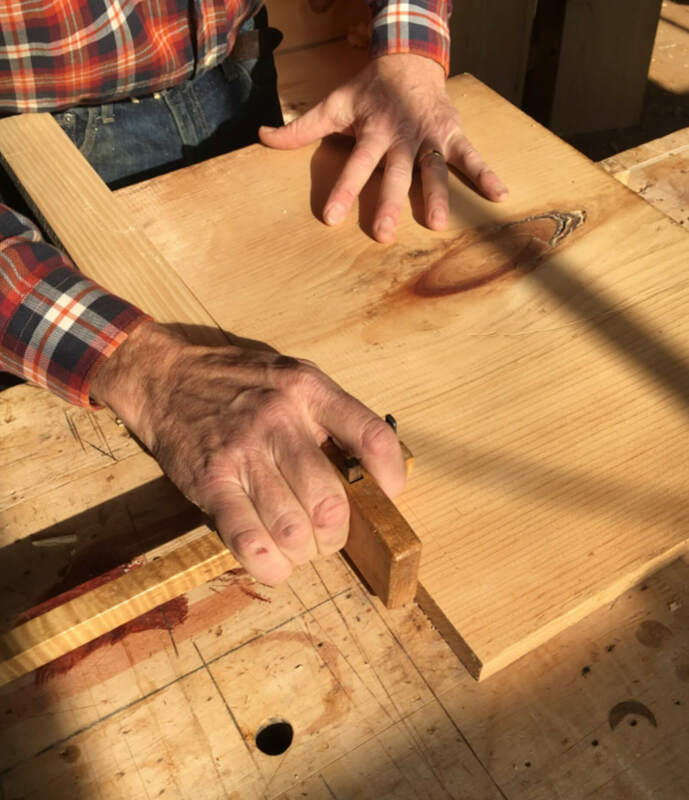 This is especially important at the beginning of the cut so the plane doesn’t take a bite off the end before it hops up on the wood and gets going. 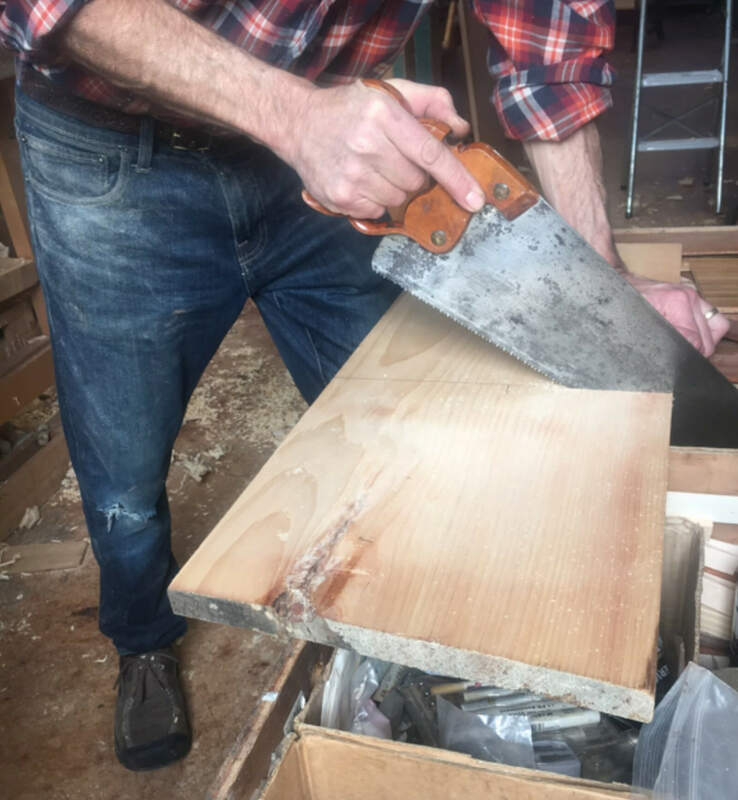 Another trick is to skew the plane at the start of the cut so that the whole blade doesn’t come up against the end of the board all at once which can be a tough jolt on the back hand. At the end of the cut the front hand does less as the rear hand follows through. At this point the plane blade’s digging action actually holds the plane on the work. A tool that probably causes more problems per ounce for students is the ordinary marking gauge, but the cure is simple. The problems arise from the fence not being flush against the work over its whole length, sometimes due to the very short length of the fence itself. When the fence tips it pulls the knife closer to the edge of the board resulting in a line that is not an equal distance from the edge and not straight. It is for this reason that I prefer the Japanese style gauges with a long fence. They are easier to keep in line and I find they encourage the proper grip, which is with fingers wrapped around the fence and the arm, thumb and pointer on the knife side of the fence and, of course, touching the wood. This way you can feel it if the fence tips! 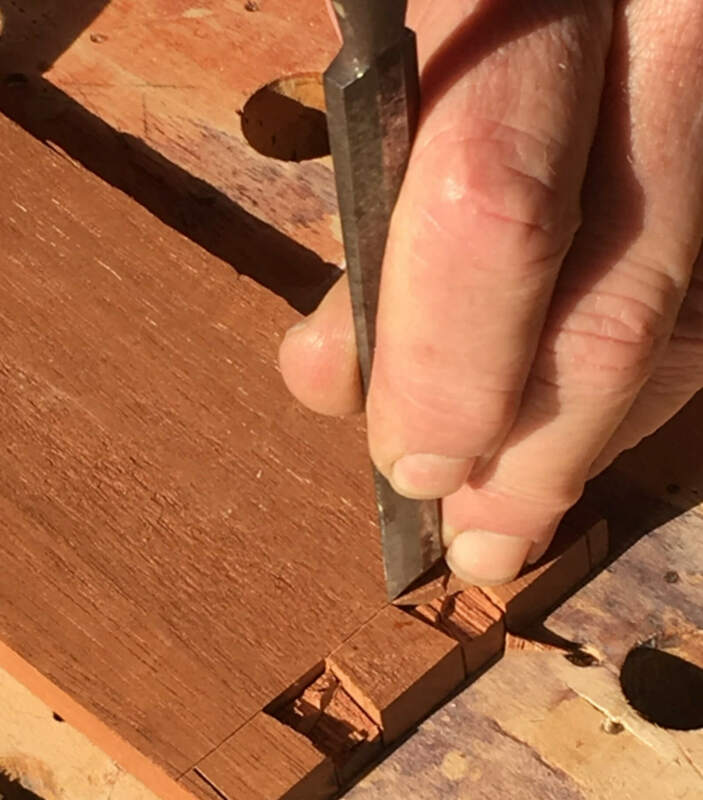 Bad scribe lines have made many dovetail makers unhappy. Ah, the wonderful spokeshave! I would be friendless without them. I have a whole draw full, but really only use about four of them regularly. 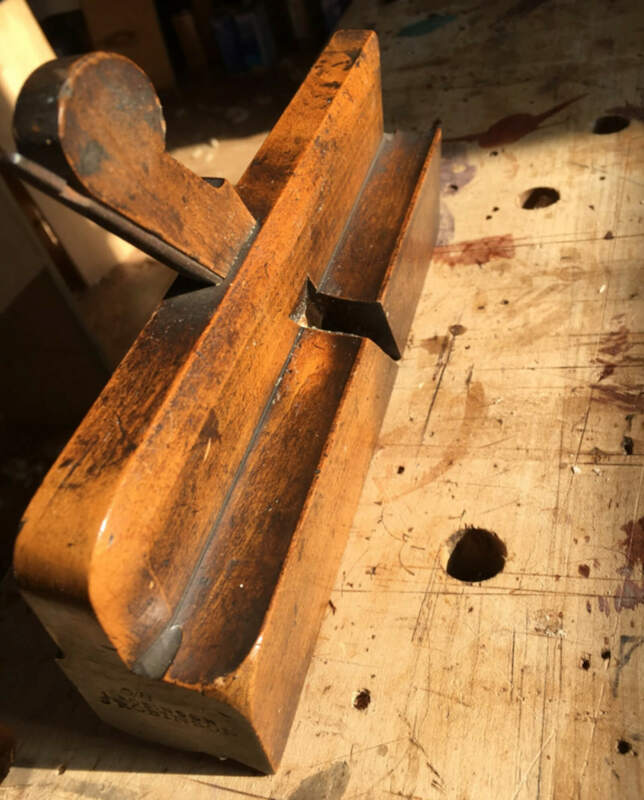 A spokeshave is really only a plane with a body that goes side to side instead of front to back. Holding a shave out at the end of the handles gives you no idea of what the blade is doing in relation to the wood. See above image. It needs to be held right down on the blade so your thumbs can push it along and your wrists can adjust the cut angle. 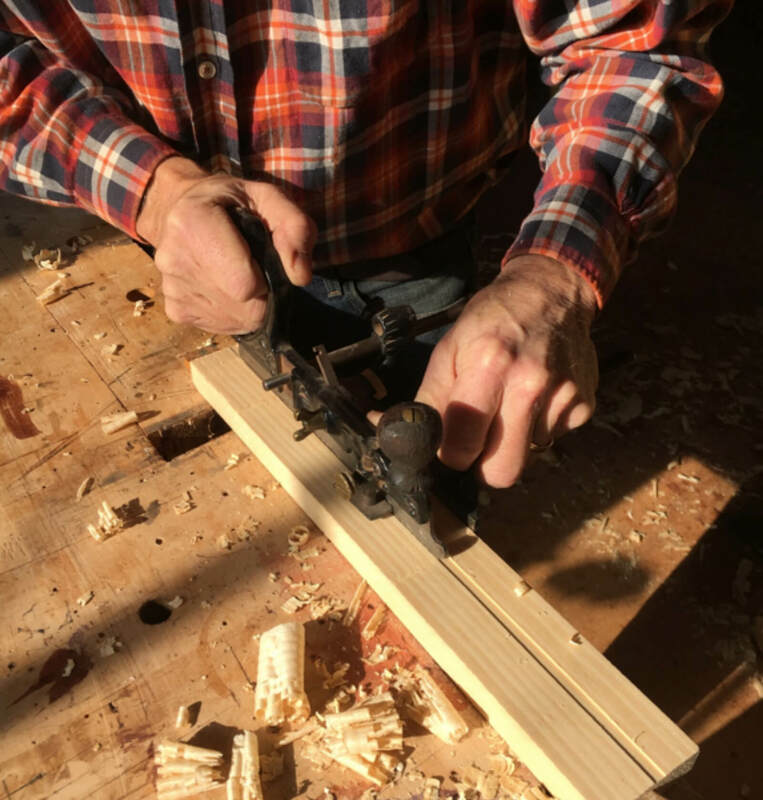 A spokeshave is rocked back and forth- rocked out of the cut on your return stroke and then back into the cut for the forward stroke. Don’t pick it up! Just slide it back and forth. I will sometimes set the blade heavy at one end and lighter at the other so I can make finer or coarser cuts without readjusting the blade. Again, the tight- to- the -blade hand position lets your brain know how to adjust your cutting angle to suit the curve you’re working on. Usually I try to talk students out of buying tools, but buy every small spokeshave you come across! They are great for ball and claw feet, chair splats and lots of other tight curves. At this point you can predict, I’m sure, what I’m going to say about chisels and how to hold them. 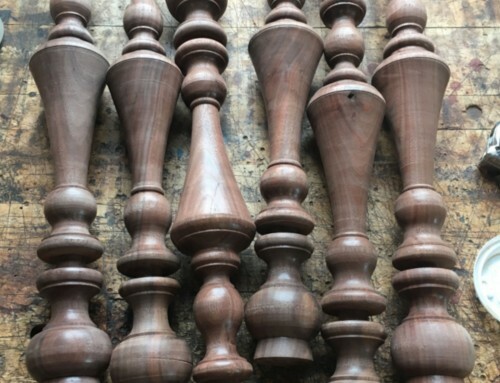 I’ll talk here about dovetailing because it makes a good illustration of my technique. 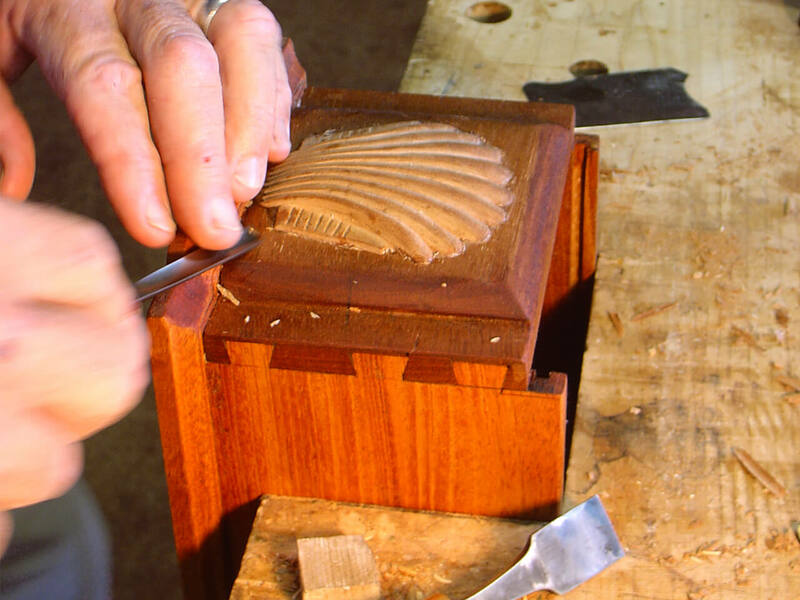 This image shows the dovetail chisel being held for my first clean-out cut between two tails. I’ve choked up on the tool and my hands are resting on the work to provide stability and control, much like you sign your name with your hand on the paper. Try doing it with your hand up in the air and you have no control. It’s the same way with most edge tools. This image shows the cut to the scribe line. 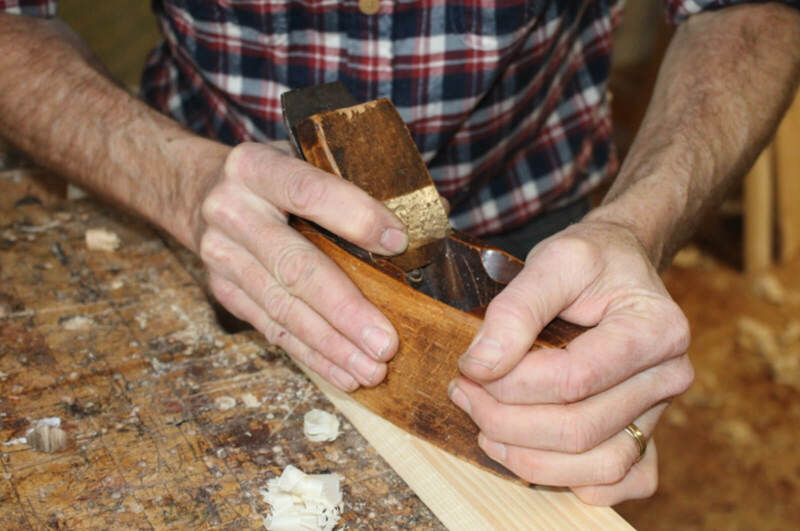 The tool is held by its very end so that it can be quickly moved to the right spot when the mallet hits. I do realize there is a wooden handle on the other end of this thing, but for this type of work it’s only there so you don’t have to swing the mallet so far. 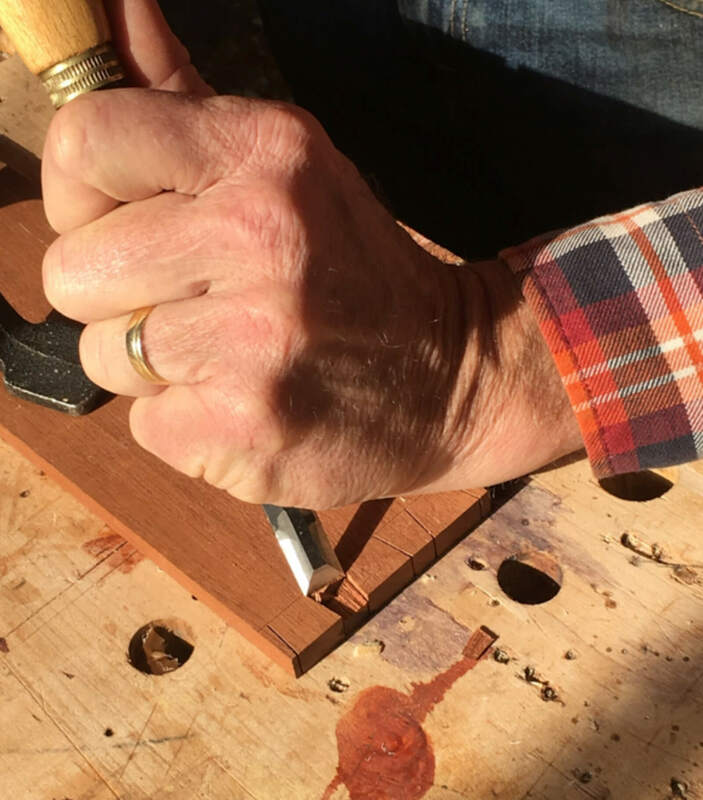 To hold the chisel by the handle at this point would be to lose your control of its edge. 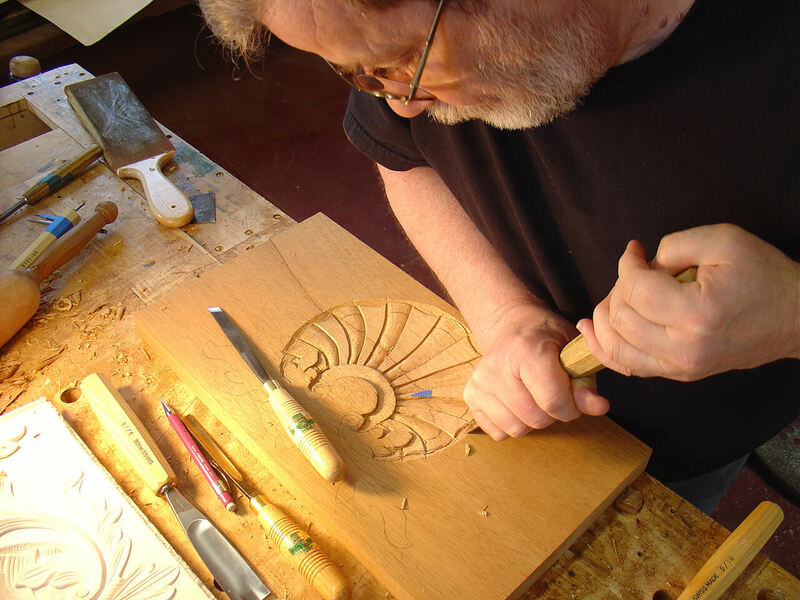 Carving tools fall under the same feedback –to-the-brain theory of operation, but with a few more variables thrown in. In this example a v-tool is describing a curve. The tool is held right by the steel with both hands touching the wood to establish angle of cut and provide feedback. The heel of the hand is the virtual compass center around which the tool is pivoting, so there’s no guesswork when it comes to steering. The right hand is the “gas”, trying to push the tool out of orbit, while the left is the “brake” keeping it from getting away. 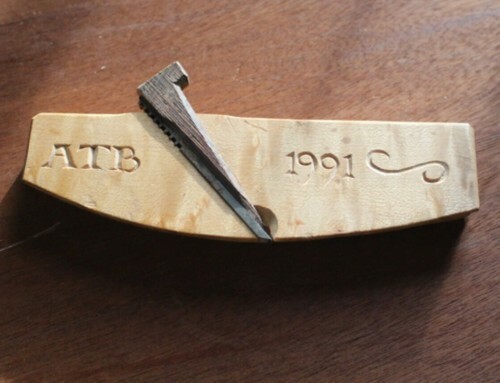 The tool is held low so that it tracks better, staying on course. With sawing, I think body position is as important as hand position. The saw is held, in this case, with the pointer on the side of the saw handle, but I think the important thing here is that the shoulder, elbow, wrist and saw tip are all in a line so that the motion of the saw wants to maintain a straight track and not be pulled to one side or the other. All your motion is going in the same direction. Finally, the act of sharpening an edge tool freehand on a stone requires a bit of thinking about how to best hold the chisel or plane iron. I always grind a hollow bevel on the dry grinder or the wet wheel. This is good for most applications. I then go to a 1200 grit waterstone. 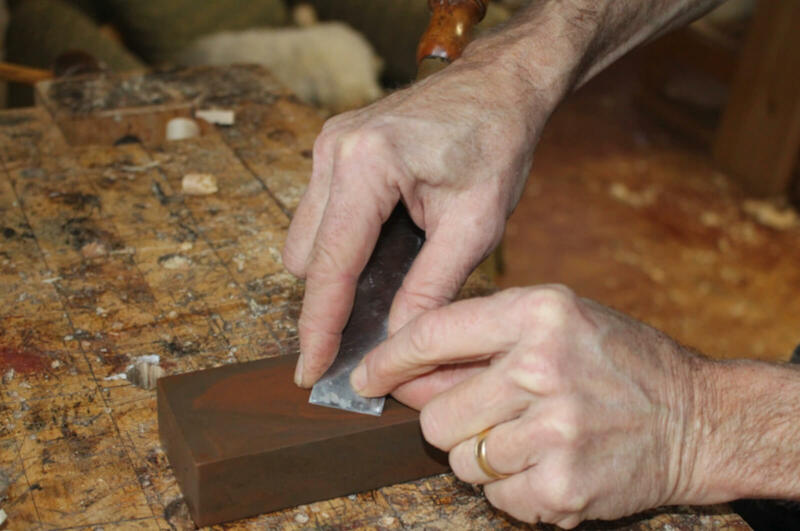 Holding the blade, in this case a paring chisel, at the very end, I set the heel of the bevel on the stone and rock the blade forward until the tip also rests on the stone. By choking up on the tool it’s easy to feel the bevel when it’s sitting in the right position on the stone. I maintain some pressure with my pointer right over the bevel so the edge doesn’t rock, and then draw the edge down the length of the stone in long elliptical strokes. This isn’t possible if you hold it by the handle, it’s just too far away! The moral of the story is: Hold the tool where you get the most control over it. It may not be where they put the handle. 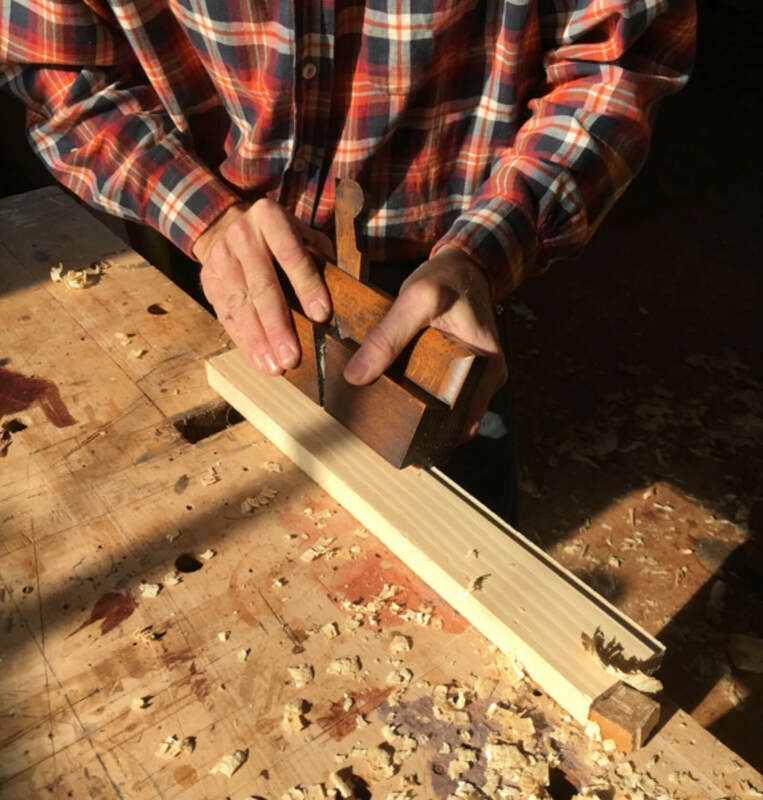 The goal of this class is to be able to do basic joinery with hand tools. Sharpening and setting up the tools will also be covered.